Place sausages in a large skillet over medium heat. Pour 1/4 cup of beer into the skillet along with a drizzle of olive oil. Cover, leaving the lid slightly ajar. Cook until beer evaporates. Slowly cook each side of the sausages until brown and crisp and the center is no longer pink. To make the mash, place potatoes in medium sauce pan and cover with water, enough to cover the potatoes. Cook over medium high to high heat. When the water comes to a boil, season with salt. Let it cook until potatoes are fork tender, about 25-30 minutes. Meanwhile, cook scallions over medium heat with a little bit of olive oil until very slightly brown, about 3-4 minutes. Drain potatoes and add butter, buttermilk, milk, cooked scallions, salt and pepper. Mash until desired consistency. Check for seasoning. For the gravy, melt butter in a large skillet over medium high heat. Add onion and cook until soften. Pour beer, scrape the bottom of the pan and let it reduce, about 1 minute. Then add beef broth and Worstershire sauce. Mix cornstarch and water together and pour into the skillet. Cook over medium high heat until reduced to desired thickness. 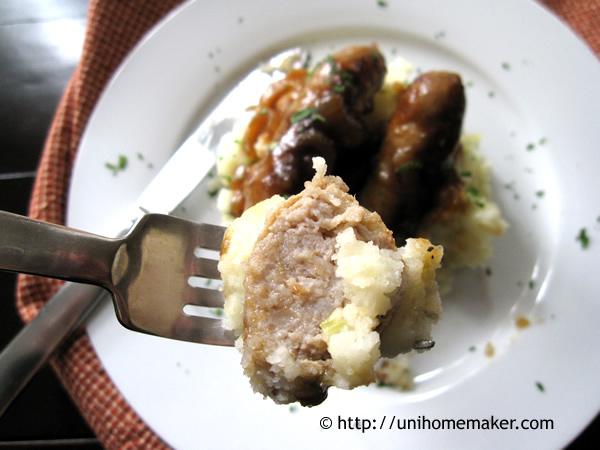 Serve mash on a plate then place bangers on the mash and pour the gravy on top. Optional: garnish with chopped fresh Italian parsley. Oh, you’re lucky if your market carries English or Irish sausages. They are such nice fresh sausages and great for this dish. My favorite UK comfort food when we lived there…. IIIIII agreeeeee!! Oh, to have English sausages. Good memories of my time in London. I’m so glad they do carry them once a year. My favorite too when I visited England. – Everyone’s posting St. Patrick’s Day themed dishes except me! And I grew up in N. Ireland. To be honest I didn’t even know when it is. – Perfect comfort food. Although I’ve never tried mash with buttermilk. Nice. My first time using buttermilk in mash potatoes, it’s quite good! I didn’t really notice a huge difference with using buttermilk, but my tastebuds are pretty unsophisticated. Anne still wonders why I love those Dorito tacos from Taco Bell. 🙂 But the scallions were definitely a great addition to the potatoes. It gave it a nice pop of flavor. This dish looks so~ delicious that I am out of words. Awesome…. I just saw this made on TV and it intrigued me. And, to be honest, your recipe looks way more delicious than theirs!! Can’t wait to try it!! So kind of you to say, thanks Cecile! This could be a 5 star meal on any day. Its the kind of comfort food where you can only find it at home. They serve this at restaurants but they are never gonna taste the same. And the Guinness beer gravy is fantastic. I will need to try this recipe! Thank you so much Danny! So lovely of you to say. Thanks for taking the time to stop by and comment. This is gorgeous and the perfect comfort dish. Loving that onion Guinness gravy, it makes me want to lick the screen. Happy St. Patties day weekend to you! Thanks Bobbi! And thanks for taking the time to comment. 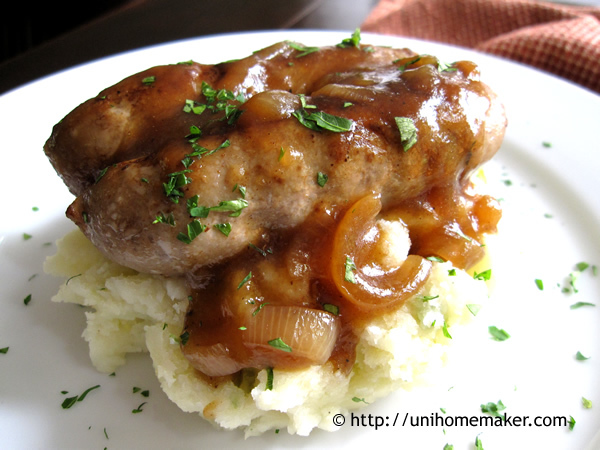 I’m sorry to say I’ve never had Banger Sausage, but it sure looks good, especially the Guinness gravy! Thanks Jan! 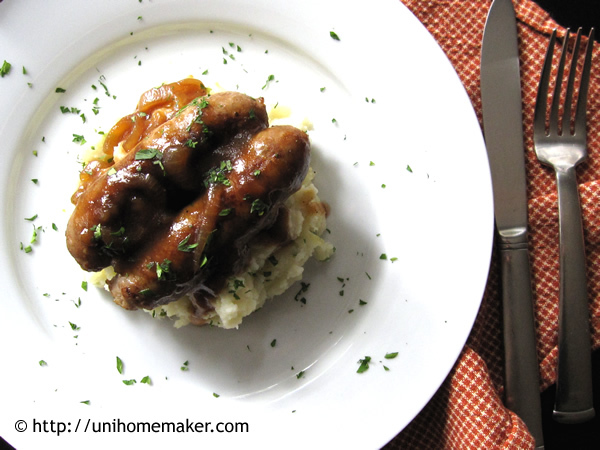 If you enjoy fresh sausages with gravy and mash potatoes, you’ll like this one. Loving the Guinness in the gravy, very clever. Thanks Claire! 🙂 For some reason, this comment went into my spam box. Sorry for the delayed response. We watched the BBC series All Creatures Great and Small based on James Herriot’s books. They often mention “bangers and mash” and I never knew what it was! Thanks for posting! Wish I’d seen this yesterday! No worries, I still have a can of Guinness left in my fridge and I am definitely making your yummy dish this week! Thanks for visiting! HELLO! Oh my gosh that looks soooo good right now. I love how you actually posted something authentic and Irish, not just something green. Mmm the caramelized onions are beautiful! I made a similar recipe like this tasty classic British one & I love it too, fropm time to time! MMMMM! Sometimes I add pear or apple slices to the stew! Thanks hon! 😉 So nice of you to visit. I’ve never had bangers before. 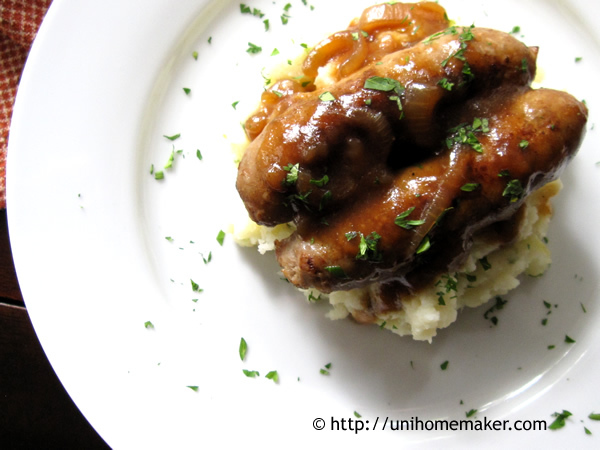 Guiness onion gravy sounds very delicious over the mashed potatoes. Perfect meal for St. Patrick’s Day. This dish is on the heavy side so I do have it once in a while. But it is delicious if you dig fresh sausage with mash potatoes and gravy. Thanks for stopping by Nami. Love the sound of Guiness gravy! Now St Patrick’s Day has gone, St George’s Day is next! Thank you for stopping by ‘tasteandlight’. Rob.